Blurb - This book gifts its reader’s five fantastic short stories that have a common aim – to spread awareness about AIDS. It is an opportunity for people to unite in the fight against AIDS and show their solidarity for HIV positive people. This book is an eye opener for everyone who wishes to see the wave of positive change in society. Everyone including the brave hearts Savita, Chintu and Mithali have the right to live with their heads held high without fear of social ostracization. Life does not have to be like this. The time is ripe to act now with one’s sense and sensibility. Break the myths. Come, be the change! What Makes the Book Tick - As the year comes to end I wanted to end it with a social message and I am glad that I got the opportunity to do so through Santosh Avvannavar’s book. The blurb provides a good insight into what this book is all about. The 5 stories that the book is made up of, talk about different aspect of life - AIDS being the most dominant. Let’s look at the stories one by one! This story, which is written as a script, deals with Shahid and his search for Anjali a.k.a Neha. It talks about his social obligation and need to solve the mystery of Anjali and her husband. This story brings to the core myths surrounding AIDS and how fake doctors and people who use black magic prey upon others, especially children. I was heart-broken when I read this story and had tears in my eyes every time I visualized the young children who are victims of people who lack knowledge about HIV positive people or just want to make easy money. If all of us had a chance to reason with God, I am sure that everyone would be born perfect! Written as a narrative, this story brings to the forefront the reality of how people with AIDS are treated. Chintu did not ask to be born HIV positive…why then should Chintu and others like him suffer for lack of knowledge? This story emphasizes the fact that people with AIDS would be able to live a better life if only we do our bit to spread the reality behind AIDS and inform people of the facts rather than let them make their own assumptions! There is a world outside that all of us know about; it’s just that most people deny it exists. This story talks about the exploitation of young girls in various industries. It highlights the fact that lust can lead to irreversible physical and mental damage which could even result in death. Maithali is one of the girls who falls prey to these men and how she ensures that they do not go scot-free! Pain, disappointment and regret, this story will make you realize that life is not easy for everyone! There are many like Savita who are seen as a responsibility and married off at an early age. They know nothing much about life, about the men they marry and yet go into it because of society and their parent’s insistence. This story, which is written as a script, talks about how Savita gets AIDS and deals with her problems with the help of positive building sessions, counseling and in turn helps others like herself. Ending on a positive note, this story is one of inspiration and strength! This story is made up of different chapters and moves away from the other four stories that have an underlying message about AIDS. Of course keeping with the main theme of the book, this story deals with a young boy, Cain and how he goes astray! The deep message behind this story is that people can change if they are loved, appreciated and understood. In this story, the author has drawn references from the story of Cain and Abel from the Holy Bible. The authors have put great thought into making the stories interesting and easy to understand. They have brought up topics about HIV positive people and problems that young children face in the hope that it will move others to reach out and remove the myths surrounding AIDS. I feel that this book should be placed in every library so that more people will be aware of how they too can make a difference! I feel the cover could have been more interesting. The slogan “No one is spared from it” could have been placed below the title instead of above it. The blurb and the reviews could have been written in black so that it would have been easier to read. Apart from this, I think the authors have done a good job of using their skills to spread awareness about AIDS. 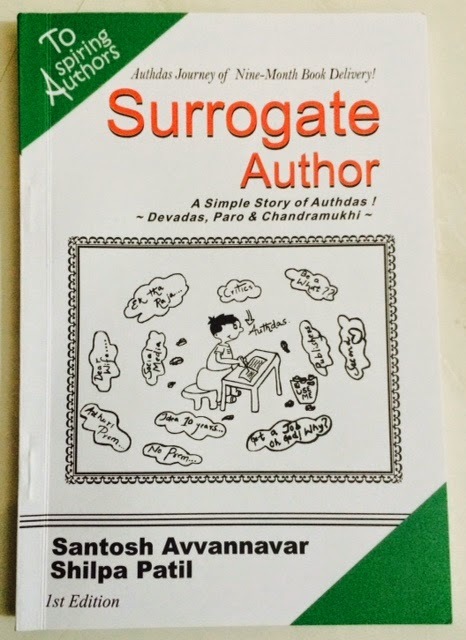 Name of the Book - "Surrogate Author" - Authdas Journey of Nine-month Book Delivery! A journey of an aspiring author having a penchant for writings through various Bollywood characters to inspire other authors through this inspiring filmy story based on Devdas. It also consists of writing tool to practice. Get-set-to read a filmy remake of writing! Come fall in love with writings! One morning I opened my mail box to find a mail from the author, Santosh Avvannavar. He had read some of the other reviews I had written on my blog and asked me to review his books. In the beginning I was skeptical as his work seemed to be “different” and I wondered if I would be able to do justice to him and his skills. After reading about him and going through the reviews of his book I decided to take on the challenge. I hope I am able to use the appropriate words to describe his style of writing and the creative ideas that he tastefully uses in his work! The book Surrogate Author talks about the anguish and the challenges that every author faces….the questions that come up in our minds! Creatively written in dialogue format, the book includes characters from Sanjay Leela Bhansali’s – Devdas and the 9 months involved in child birth to explore the entire process of writing. Kudos to the writers for using this method to encourage aspiring authors! I especially liked the way that the authors have described Ideas, keywords and other processes involved in a manuscript. A budding writer will certainly benefit from such details. As an Editor and English language teacher who is forever looking for grammatical and punctuation errors, the little editing lapses in the book did stop the flow. Of course, since this is the first edition, I am sure that the second edition will be without flaws! Santosh started his career as a consultant and Soft Skills Trainer. After his college education from NITK, Surathkal, he worked as a researcher at University of Eindhoven, University of Twente, and Indian Institute of Science, Bangalore. He was also the Placement President while working at IISC, Bangalore. He has over twenty-five publications of mostly research documents in national and international journals. He has also authored sixteen conference papers and regularly writes articles for a national and worldwide daily paper. He also works as an advisor for different organisations. He also dabbles in fiction writing and is the author of Adhuri Prem Kahaniya; Dear Wife, Your Husband is not a Superhero, Second Heart and Get a Job WITHOUT an Interview; Be A B.A. 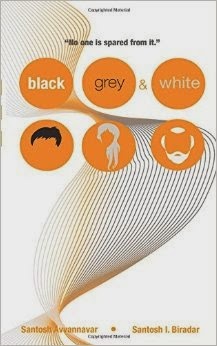 ; Surrogate Author; Title is Untitled; Black, Grey and White. He likes to devote his personal time in writing for a website, namely the Amrita Foundation for HRD (www.amritafoundation.wordpress.com). He has conducted seminars and training sessions for more than 40,000 people in India and abroad over the last seven years. Shilpa is a faculty at KSWU Bijapur. She holds a Master’s Degree in commerce from Karnataka State Women’s University, Bijapur and a Bachelor’s degree in Commerce from A.S.Paril College of commerce, Bijapur.